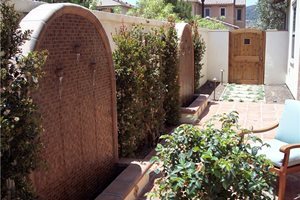 Planted spaces that are left over between outdoor living spaces must be designed both as attractive focal points and solve problems such as runoff velocity and erosion. A great deal of planning is involved to link all levels of this house with many levels of outdoor living space. Split level home landscapes must be designed to ensure runoff from the lawn does not cause slope failure or flooding beneath the deck or the house foundation. On this site without ground space, the grid railing and double gates provides an on-deck dog run where Poochie can still be close, but not underfoot. The landscape architect's greatest challenge is design of split level homesites. These difficult sites require considerable engineering and attention to detail related to elevation changes and accessibility. Erosion control and slope stabilization strategies are also crucial. It's important for the homeowner to be aware of the most common challenges their designer will face when laying out the site plan for these often complex projects. The more you know, the better your communication will be with your designer during the design process, pointing out areas that are lacking, or places where opportunities can be exploited. To follow are the six most common areas where you may encounter problems during the design process. All too often these are not identified until the project is complete and changes become vastly more expensive. Where space is limited by irregular terrain, the front entry becomes more than a transition to the house. It is doubly important when the exposure here is opposite that of the back of the home where the majority of outdoor living spaces occur. When the front is exposed to the morning sun, it may prove the only outdoor area for basking and coffee. Therefore, if space allows, ask your designer to create a more intimate spot, protected by screens and plants for privacy, but still fully exposed to the sun. If the front of the house faces west, the same applies in reverse for a cocktail at sunset. Create space for at least one comfortable chair, perhaps two. Plant to provide privacy if exposed to the street or neighbors. Integrate the space with the house structure to avoid building code height limitations. Split level homesites often feature a variety of living spaces, sometimes on grade such as a terrace. 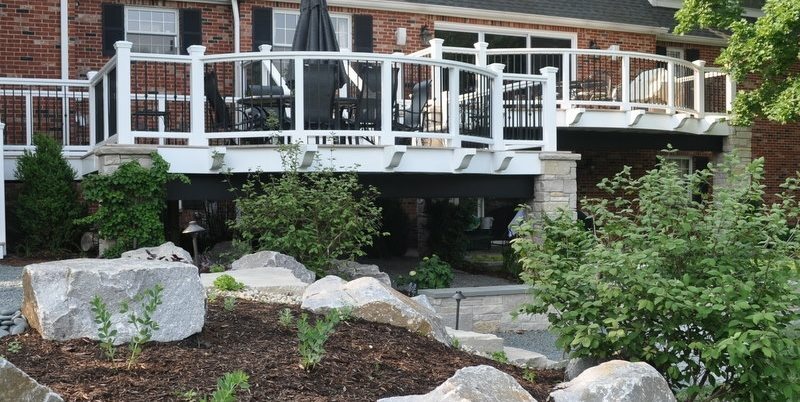 However, on sloping homesites a deck may be the only usable outdoor space, so the value of these living spaces are far greater than on a level homesite. With such emphasis it is essential they be designed larger than you might consider adequate for an ordinary suburban lot. All too often a split level home is the result of a high value lot on difficult terrain. Before you buy, build or attempt a major remodel, demand a full analysis of underground conditions by a licensed geologist or civil engineer. Their report may prove the nature of the bedrock too fractured for ordinary footings and require special high cost engineering and reinforcement. Design of decks on irregular topography is complicated by footings installed into sloping ground, and often they must be deep enough to reach bedrock for stability, particularly in earthquake prone California. This results in increased construction costs, which are often shaved down by reducing the overall size of the deck. 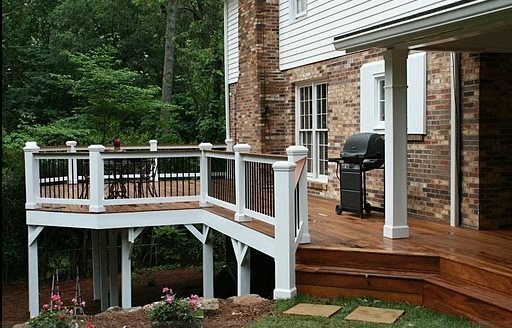 This is the last place to downsize because a deck too small to use properly will forever be a problem you'll regret. 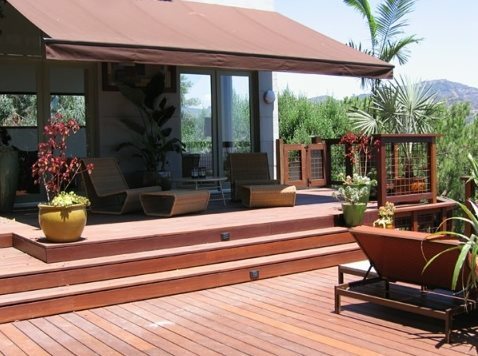 For more on deck sizing to accommodate all your specific uses while maintaining a sense of spacious elegance see Outdoor Deck Sizing Tips and Patio Layouts. Homes on level ground can build out most of their outdoor space, but split level homes can be severely limited. After all the living spaces and their transitions are created, there's very little area left for storage of things most homeowners take for granted. Failure to create areas for firewood, garbage cans, bicycles or something as simple as a clothes line means they must be forced into the crowded garage. Experienced designers know how valuable small nooks and crannies can be for this type of utility. 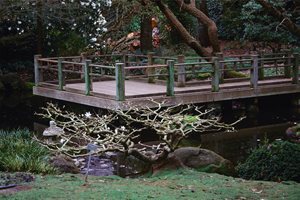 A landscape architect with a firm grasp of the grades will create these spaces automatically when the opportunity arises during the design process. Keep these items in mind when reviewing your plans to ensure all opportunities are exploited, because retrofitting such a site after construction can be next to impossible. Be sure to create a secure run for the family dog. Create screen panels that block views but allow air to pass through. Provide overhead structures to protect storage from rain. Locate firewood storage where it's convenient to indoor fireplace or wood stove. All elevated living spaces must have safety railings or some sort of barrier to protect users from stepping off the edge. The key is to create safety with as little mass as possible. Massive safety railings make the user feel closed in. 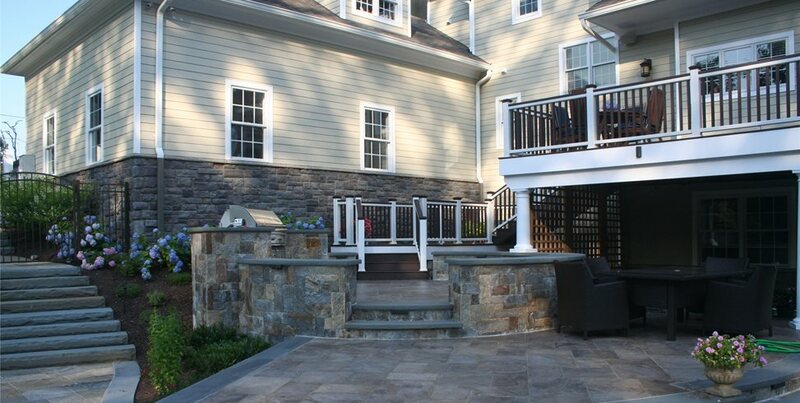 Heavy railings also present a greater load or horizontal pressure upon the structure. Whenever possible, exploit new light weight materials other than traditional wood railings, which eventually weaken from dry rot and weathering. To create more space, design seating and table tops for stand-up usage into the design to reduce the amount of furnishings needed when entertaining. 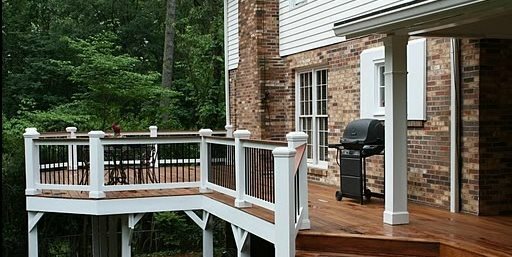 Above all, make sure the railing is safe enough to protect pets and children. Cable railings are least likely to obscure your view. Tubular aluminum railings are lightweight and open. Avoid steel and iron due to the potential to rust over time. Utilize recycled wood such as Trex for wood-look seats and wider rail tops. Create rail tops wide enough for a small plate to sit on when entertaining. Every split level lot will be different, but all of them share problems with drainage. t is far too easy to send drainage down the face of slopes, but this can cause long term damage to the stability of the subsoils. When downspouts, for example, are not drained into a storm drain system, they will run down slope, carving away deeper and deeper into the face. In fact, one of the most common causes of slope failure in constructed homesites is over-irrigation or undetected leaks from pressurized pipes and valves. Before anything is built on site, make sure that your landscape architect or civil engineer creates a detailed drainage plan for the site so whether you wash the car or there are torrential rains, you won't have to worry about mudslides. Create diversion ditches at the top of slope to prevent direct runoff away from the face by catching and moving water to edges of the site. 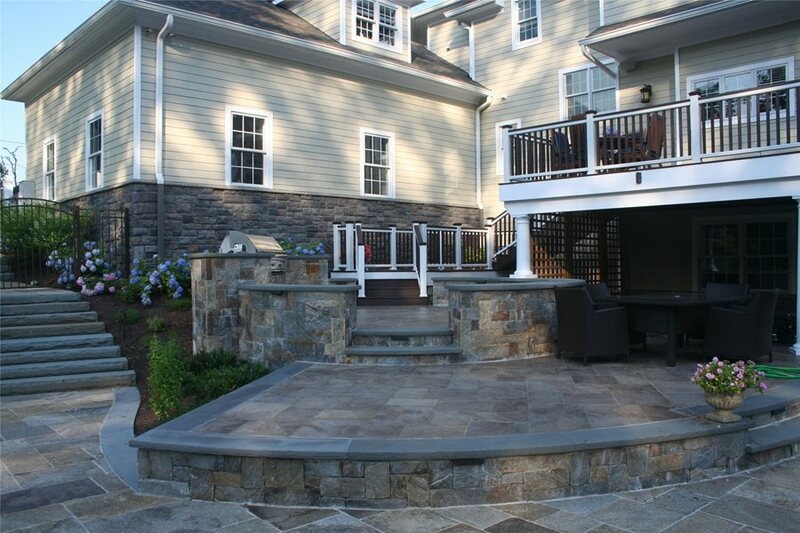 Utilize French drains to gather and hold excess water upslope from a house or patio. Beware of paths, trails and walkways built into a slope which may become drainage ditches. 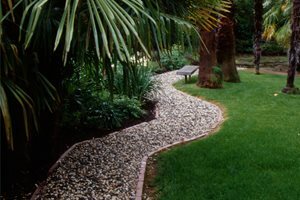 All sloping ground, be it steep or gently rolling, is vulnerable to surface erosion. Your designer must be fully aware of the importance of this living coverage for slopes that helps to slow runoff velocity. The slower the runoff the fewer soil particles are carried away. But this isn't just about covering ground. The slopes present the open areas between living spaces such as decks, so it must be highly attractive and compliment the architecture. 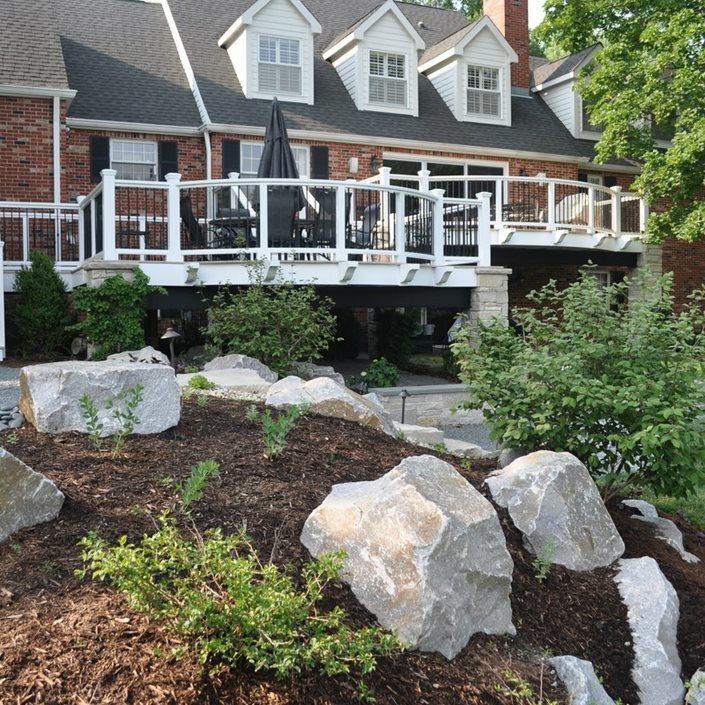 Therefore you won't just seed the hillside, but the landscape architect must devise a more detailed program for utilizing trees, shrubs and perennial plants to protect the very ground your split level stands upon. In high wildfire hazard zones, it is important that this planting offer minimal fuel volumes and conforms to local Fire Safe ordinances. 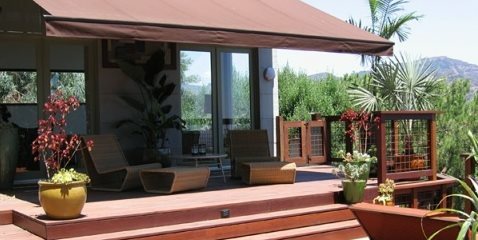 Design high intensity planting to flesh out spaces between decks with color and interest. Exploit lighting opportunities for ambient illumination amidst planting. Utilize deep rooted shrubs to bind subsoil layers. Spreading shrubs are excellent coverage that requires only one irrigation point. Hydroseeding is essential the first year to prevent disturbed soils from eroding. Provide an access trail to all parts of the site for gardeners to cut back excessive vegetation.